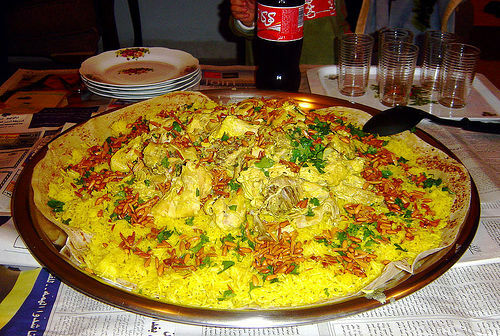 Mansaf is a Jordanian dish. Today it has been adopted as the national dish of Jordan, made of lamb cooked in a sauce of fermented dried yogurt and served with rice. Left: A homecooked Mansaf, Amman, Jordan. The lamb is cooked in a broth made with a fermented then dried yogurt-like product called jameed, and served on a large platter with a layer of flatbread (markook or shrak) topped with rice and then meat, garnished with almonds and pine nuts, parsley and then sauce poured over all. Mansaf is served on special occasions such as weddings and births, or to honor a guest, and of course on main holidays such as Eid ul-Fitr and Eid ul-Adha. It is traditionally eaten collectively from a large platter in the Bedouin style, standing around the platter with the left hand behind the back and using the right hand instead of utensils. Other variants of the dish also exist and are adapted to the regional tastes and circumstance. These include fish mansaf, found in the south around the port city of Aqaba. An urban less ceremonial adaptation of mansaf using non-dried yogurt is called shakreyyeh. It is sometimes cooked with poultry instead of meat and is common in the northern part of Jordan.